second minute The flight of the ball deceived Kilbrittain goalkeeper Ian Hodge and dropped into the net. They added a point from a free a minute later. Bride Rovers were now finding the going tough. With five minutes to the break a strong run by Ciaran Byrne ended when his shot came back off the upright only to be finished to the net by Sam Shorten. This was the way it ended for the break, Kilbrittain 1-3 Bride Rovers 1-1.
limited. Bride Rovers pointed a free to reduce the gap on ten minutes. Ciaran Byrne pointed a free a couple of minutes later before a Bride Rovers purple patch yielded two points in quick succession to level the game. Ciaran Byrne scored a lovely point to edge Kilbrittain back in front with ten minutes to go. Bride Rovers really upped the ante for the last ten minutes and Ian Hodge in the Kilbrittain goal was impressive with two quick saves off the line before Ciaran Byrne scored the insurance point with four minutes to go from a free. There was time for Hodge to emerge the hero with two more goal line clearances and with the Kilbrittain defence as a whole, defending for their lives, Kilbrittain held out for a famous win. 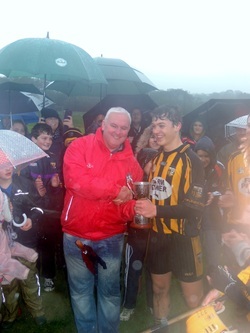 Captain Tadgh Kearney collected the cup amid scenes of Jubilation. Final score Kilbrittain 1-07 Bride Rovers 1-05. Team and Panel: Ian Hodge, Eoghan Byrne, Sam Dewey, Darren Burke, Bertie Butler, Tadgh Kearney, Shane Sweetnam, Tomas Sheehan, Darragh Moore 0-2, Philip Wall, Ryan Lombard 0-1, Sam Shorten 1-0, Ciaran Byrne 0-4, 0-3 frees, Oisin Dewey, Morgan Madden, Aaron Holland, James O'Donovan, Dylan Twohig, Nicholas Ustianowski, Kynan O'Hara, Jack O'Donovan, Kieran Murphy, Eoin Galvin, Misco Savic. In wet and windy conditions, the premier intermediate hurlers beat Bandon to bring home the Micheal Holland cup for the second time. Kilbrittain played against the gale and the driving rain in the first half and Bandon dominated the early part of the game. Bandon points from Micheal Cahalane and Jason Hickey and Darren Crowley from a free saw them surge ahead. Maurice Sexton pointed for Kilbrittain in the 10th minute. By the end of the first quarter Bandon had increased their lead to five points, 0-6 to 0-1. Declan Harrington and Paudie Hurley combined well for Hurley to point on 19 minutes. Jamie Wall added a free soon after, but as the torrential rain made life miserable for both sides, Bandon started to cope better. Points from Cahalane two, and Crowley two, one from a free put them in control by the 30th minute. Then in injury time a Ross Cashman clearance added to by Vincent O’Brien was broken onto the on rushing Declan Harrington who finished it to the net. This was followed by a Jamie Wall point a minute later to make it Bandon 0-10 Kilbrittain 1-4 at the break. Turning to play with the elements, Kilbrittain had a dream start as Declan Harrington goaled again within thirty seconds as he followed in a Maurice Sexton delivery. As the rain eased, Bandon refused to let Kilbrittain go ahead but two pointed frees were cancelled by Jamie Wall and Maurice Sexton. Kilbrittain then hit the front following a Wall free in the 38th minute. Tomas Harrington and Marc Sugrue exchanged points. Two Cahalane frees put Bandon back in front and Declan Harrington levelled it again in the 49th minute. Micheal Cahalane responded with a point before Sexton levelled it again with 8 minutes to go. Jamie Wall gave the Bandon goalie no chance with four minutes to go to score a goal to put Kilbrittain 3 points to the good. The resultant puck out was sent back over the bar from Alan Hayes and suddenly Kilbrittain were pulling away. Bandon were shell shocked and gave a free to Wall who duly converted. In injury time Declan Harington had the final say with a bullet from close range to register his hat-trick and with 2-2 without reply in those last five minutes, Kilbrittain reclaimed the cup last won in 2010 with a 4-12 to 0-16 score-line. chairman of the West Cork board. 'We were robbed!' was one reaction floating around following this West Cork final replay in Rosscarbery. Kilbrittain held O'Donovan Rossa level at halftime and lead for all the second half. Two points up deep in injury time, Kilbrittain felt they had this won but a questionable close in free, brought to a more favourable position, gave the Skibb side a lifeline which they duely availed of as their goalkeeper blasted the free to the net to win the game for the county champions by the narrowest of margins. minutes. Kilbrittain captain Sean Hayes added a point immediately to level matters. A Skibb free put them ahead again with time almost up. Edward Sheehy tied the game in the third minute of injury time to leave the halftime score 0-6 a piece. Final score Kilbrittain 0-14 O’Donovan Rossa 1-12. Team: Llyod McSweeney, John Dollard, David O’Sullivan, Owen Hurley, Kevin O’Neill, David McSweeney, Ronan Sheehan, Ryan Crowley, Edward Sheehy 0-8, 0-5 frees, Gerry Coughlan 0-3, Conor O’Donovan, Maurice Fielding 0-1, Cary Hayes, Declan O’Donovan 0-1, Sean Hayes 0-1. Kilbrittain met O'Donovan Rossa in the Junior B hurling west cork final at Rosscarbery. The newly crowned county champions from Skibbereen opened the scoring in the first minute with a pointed free and added their second in 4th minute to go two points up. A minute later a low Edward Sheehy free caused confusion in the Rossa's defence and Sean Hayes latched onto the breaking ball. Sean did what he has done in previous games, turned and fired a low shot into the net for Kilbrittains opening score. Kilbrittain took over for the next six minutes but failed to show that on the scoreboard. Maurice Fielding did score a fine point from out by the far sideline on 9 minutes before the Skibb side found the net themselves following a delivery across the 14 yard line that was directed past Llyod McSweeney for a rather scrappy goal in the 11th minute. This ignited O'Donovan Rossa and only for their bad shooting, they could have been well up at half time. A point and 6 wides in the next ten minutes during which time Kilbrittain found it difficult to make much progress. A goal bound 21 yard free by Sheehy was saved and cleared at the quarter hour mark was the best chance Kilbrittain had. David McSweeney was very harshly pulled for a perfectly legitimate tackle when he very cleanly won a ball which lead to a fruitless free for the Skibb side. They increased their lead 7 minutes to the break with a point. Kilbrittain had a couple of chances before Gerry Coughlan pointed with 2 minutes to the break. Alex O'Brien did have a chance but it didn't change the score that read at halftime, Kilbrittain 1-2 O'Donovan Rossa 1-4. Kilbrittain tore into the second half with chances for Edward Sheehy and Sean Hayes but it was O'Donovan Rossa who opened the scoring again in the 2nd minute when a long range low shot deceived the Kilbrittain rear-guard and ended up in the net. Despite this set back, Kilbrittain responded well and a point in the 4th minute from Conor O'Donovan and two converted '65's in the 6th and 7th minutes from Edward Sheehy brought Kilbrittain back into the game. Sheehy added an inspirational point from a free some 80yards out in the 10th minute. The Skibb side replied with a point and Sheehy added a point from a free to make in O'Donovan Rossa 2-6 Kilbrittain 1-7 at the halfway point. Kilbrittains backs we clearing they're lines well with John Dollard and David O'Sullivan clearing a lot of ball. Kilbrittain introduced Cathal Moore and he soon had a telling impact as he collected a high ball and booted to the net to put Kilbrittain ahead. Sheehy added a poin from play and Kilbrittain were now two points to the good with 10 minutes left. The Skibb won a couple of soft frees and with 3 minutes to go, re-gained the lead with their third free on the trot. Ryan Crowley levelled matters a minute later with a fine point but O'Donovan Rossa replied immediately with time almost up. In a whelter of excitement, Kilbrittain finished strong. Maurice Fielding had a chance but it was Gerry Coughlan who saved the day for Kilbrittain with a fine point from out by the sideline to earn Kibrittain a deserved replay. Team: Llyod McSweeney, Owen Hurley, Davie O'Sullivan, John Dollard, Kevin O'Neill, David McSweeney, Ronan Sheehan, Alex O'Brien, Edward Sheehy 0-5, 0-2 '65's, 0-2 frees, Gerry Coughlan 0-2, Conor O'Donovan 0-1, Maurice Fielding 0-1, Gary Hayes, Declan O'Donovan, Sean Hayes 1-0. Subs used: Ryan Crowley 0-1, Cathal Moore 1-0. The Junior B hurlers were in championship action when they played Randal Og in the semi-final on a perfect sunny day in Bandon. a free for Kilbrittain. This was Kilbrittains last score for fourteen minutes and during this time Randal Og added three points to increase their lead. Gary Hayes stopped the rot with a goal bound shot saved over the bar. Randals added a point before a Sheehy free was doubled on by Declan O'Donovan who was unlucky as Patrick Lynch in the Randals goal made another good save. Sheehy added a free followed by a Randals point to leave the halftime score Kilbrittain 0-4 Randal Og 1-6. Randal Og sent a free wide on the re-start. Kilbrittain then got a lifeline as two goals in as many minutes changed the game. Gary Hayes scored a beauty in the 2nd minute and before Randal's could respond, Declan O'Donovan had the ball in the net again as he caught a Ryan Crowley delivery, turned and sent a low shot past the Randals goalie. Edward Sheehy added a free and all of a sudden Kilbrittain lead by two, 2-5 to 1-6 after five minutes of the second half. Randals were hit for six and with Sheehy, David McSweeney, John Dollard, Davy O'Sullivan and Owen Hurley all showing experience to batten down the hatches, it took until the 15th minute for them to score. Meanwhile, Kilbrittain added a third goal courtesy of a low Sheehy free from 35yards that went all the way to the net with the goalie looking at the blinding low sun. Sheehy added a point from play before Randals hit a purple patch on the quarter hour. Three points in as many minutes cut the deficit but Kilbrittain through Sheehy with two pointed frees in the 19th and 21st minutes, held on for a great victory and a mouth watering meeting with county champions O'Donovan Rossa in the final. Final score Kilbrittain 3-08. Randal Og 1-10. Team: L McSweeney, J Dollard, D O'Sullivan, O Hurley, M Fielding, D McSweeney, R Sheehan, A O'Brien, E Sheehy 1-6, 1-5 frees, G Hayes 1-2, C O'Donovan, G Coughlan, D Hayes, D O'Donovan 1-0, S Hayes (Capt). Subs used R Crowley, K O'Neill, C Moore, A O' Regan. 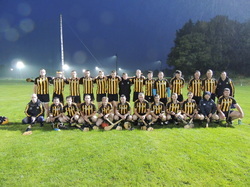 Kilbrittain Junior B hurlers played Bantry in the first round of the championship in a wet drizzley Dunmanway under lights. Beaten by Bantry at the semi-final stage last year, Kilbrittain fielded a somewhat more experienced team with Edward Sheehy at midfield, David McSweeney eligible again this year, at Centre Back and veteran David O'Sullivan at full back. Bantry opened the scoring with a pointed Garry Hurley free in the first minute. Edward Sheehy responded with a '65. Kilbrittain started to trouble the Bantry defence from an early stage and had a couple of chances before captain Sean Hayes scored a brilliant point over his shoulder in the 6th minute. Bantry added a point from play (Foley) and another from a Hurley free before a good pass by Declan O'Donovan found Sean Hayes inside his marker and he made no mistake with a bullet of a shot into the Bantry net from close range. O'Donovan himself pointed a minute later and Kilbrittain proceeded to dominate the next fifteen minutes. A beautiful sideline cut over the bar by Edward Sheehy and a missed '65 were followed by Kilbrittains second goal. Declan O'Donovan was the provider again when he found his brother Conor with a cross field pass. Conor on the edge of the square fired a rocket to the roof of the net. Hayes pointed soon after and Ronan Sheehan scored a fine point with five minutes to the break. Sheehy missed and then pointed a free. From the resulting puck out, Gary Hayes won a great ball and passed to Declan O'Donovan who finished the sliothar to the net for Kilbrittains third goal. There was time for Bantry to respond with their fourth point before the halftime whistle. Halftime score Kilbrittain 3-7 Bantry 0-4. Kilbrittain started the second half with a point from Declan O'Donovan who showed great fielding ability to catch a high ball. Edward Sheehy added a point in the second minute. Bantry responded with two points, a free from Hurley and a good point from play by Foley who was operating from wing back for the second half. Declan O'Donovan caught another great ball and pointed on the quarter hour, Sheehy pointed a free and a good move involving Declan and Conor O'Donovan resulted in the latter scoring a fine point. Sheehy added what turned out to be Kilbrittains final score with 9 minutes to go. Kilbrittain took the foot off the pedal and emptied the subs bench for the final ten minutes which saw Bantry score 1-2 with the last point in injury time. These were only consolation scores as Kilbrittain advance to meet Randal Og in the semi-final. Team: Llyod McSweeney, Owen Hurley, David O'Sullivan, John Dollard, Ronan Sheehan 0-1, David McSweeney, Maurice Fielding, Edward Sheehy 0-6, 0-1 '65, 0-1 s/line, 0-3 frees. Alex O'Brien, Gary Hayes, Conor O'Donovan 1-1, Ryan Crowley, Darragh Hayes, Declan O'Donovan 1-3, Sean Hayes (Capt) 1-2. Subs used Cathal Moore, Denis Twohig, Gerry Coughlan, Gerard Whelton, Sean Coughlan. 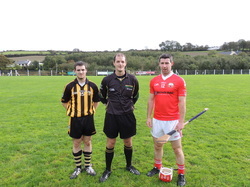 Kilbrittain and Watergrasshill met in the quarter-final of the premier Intermediate hurling championship in Pairc ui Rinn. Kilbrittain were without Vincent O'Brien but had Alan Hayes returning from injury and Conor Moloney back from the US. Kilbrittain were dominant in the opening thirty minutes but despite going in level at halftime, they would live to rue the amount of wides especially during the first half. Kilbrittain were they brighter starters but following three off target shots in as many minutes it was Watergrasshill who opened the scoring in the third minute through Paudie Cahill who pointed before he fired in a low shot past Robert Hayes inside six minutes. Impressive Ross Cashman opened Kilbrittains account with a pointed '65 a minute later and following a Jamie Wall point in the 10th minute, Kilbrittain were to dominate the remainder of the half. However they found it hard to translate that on the scoreboard and fired five wides in the next six minutes. Jamie pointed a free and immediately after, Alan Hayes hit a rasper that was deflected over the bar for Kilbrittain's 4th point and the equalising score. Watergrasshill were living on scraps at this stage but managed to poke their noses in front with two points within a minute with 9 minutes on the clock to halftime. While Connor Moloney and Hayes missed chances, Wall kept Kilbrittain in touch with a lovely point. Maurice Sexton levelled the game again with 2 minutes left and David Desmond put Kilbrittain ahead with a point with time up. Watergrasshill tied the game in the final minute following an intercepted clearance, with the sides level 0-7 to 1-4 at the short whistle. Watergrasshill would have been the happier at this stage as they were level with limited possession and only three wides over the first half. Kilbrittain however should have been well up had they not clocked up 11 wides with some of those well off the target. Watergrasshill regained the lead immediately after the re-start. Pat O'Mahony was off target twice in quick succession before Maurice Sexton hit two superb points within a minute of each other in the 6th minute. Watergrasshill responded with a point followed by an unsuccessfull effort from Sexton. Cashman and Hayes had chances in the 9th minute but it was Watergrasshill who now started to take control. A point in the 12th minute started a period of dominance, but with three wides , two from frees, they failed to pull away. Four points between the 16th and 22nd minutes sandwiched two Kilbrittain scores, both from Jamie Wall whose marksmanship made him Kilbrittains most dangerous forward. His point on 17 minutes was the score of the match as he blocked a Watergrasshill clearance, controlled the sliothar on his hurley, turned and pointed. Watergrasshill defended strongly for the last ten minutes with Ian Gardiner, Patrick O'Regan, Noel O' Riordan and Kieran Coakley to the fore. Paudie Cahill was prominent again in the latter stages as he fired over three points in the last three minutes, the first of which came directly from a Kilbrittain mistake. Jamie Wall did add a point for Kilbrittain with two minutes to go but time ran out for Kilbrittain and with eight more wides in the second half, nineteen for the game, it was really a game where Kilbrittain lost it rather than were beaten! Team: Robert Hayes, Cal McCarthy, John Murphy, Damien Desmond, Cian O'Leary, Ross Cashman 0-1 '65, Darren Hickey, James Deasy, Chris Hickey Capt, Connor Moloney, Maurice Sexton 0-3, David Desmond 0-1, Pat O'Mahony, Alan Hayes 0-1, Jamie Wall 0-6, 0-3 frees. Subs used: Declan Harrington, Tomas Harrington, Paudie Hurley. Kilbrittain went into this Clona Milk U21A hurling West Cork semi-final against Newcestown with not a lot of preparation as it is difficult to fit in U21 between Premier intermediate, junior and minor hurling championship preparation. However, on paper Kilbrittain went into the game with plenty experience through Jamie Wall, Chris Hickey, Declan Harrington, Ivan Burke, Nick O'Donovan, James Hurley, to name a few. The absence of Conor Moloney would prove crucial though as a younger Newcestown side pulled away in the the final five minutes to secure a place in the final against Bandon. Kilbrittain, playing with the strong wind, started brightly with a point from Declan Harrington inside the first minute. Newcestown equalised through a '65 in the 3rd minute. Kilbrittain fairly dominated the first quarter but the score board didn't reflect their dominance. It took until the 18th minute before Jamie Wall pointed from a close in free. He added another free a minute later to increase the lead 0-3 to 0-1. Newcestown pointed from play with five minutes to the break to keep in touch. Wall pointed a long range free with three minutes to the break followed immediately by a good effort from Eamon Lyons which fell narrowly wide. While five minutes of injury time was played, the scoreboard did not change and the sides went in at halftime. Kilbrittain 0-4 Newcestown 0-2 and one feared it was not enough after playing with the strong wind. The wind died somewhat on the resumption and didn't really have a bearing on the remainder of the game. Wall missed a free in the first minute but Declan Harrington pointed immediately to increase the lead. Newcestown responded with a point in the 3rd minute and two within the 6th minute to level matters 0-5 each. Then two minutes later a fierce drive by Ivan Burke, found Ryan Crowley who passed on to Declan Harrington whose run of 25yards ended with a bullet to the back of the net. This gave Kilbrittain breathing space and while Newcestown added a point a minute later, Wall pointed a free in the 13th minute to restore Kilbrittains three point advantage. On the quarter hour Newcestown cut the deficit to two and again added another two minutes later to leave the bare minimum between the sides. Newcestown began to get on top at this stage and Llyod McSweeney had to bring off a good save from a close in free with nine minutes left. Wall had the opportunity to push Kilbrittain further ahead with a free a minute later but to no avail. With three minutes on the clock Newcestown levelled the game again with a pointed free and try as they might, Kilbrittain couldn't respond and with two more scoreable frees given away, they handed Newcestown their chances to lead and pull away in the 28th and 30th minutes. While a further two and a half minutes were played, Kilbrittain couldn't make a break through and Newcestown held on to advance. Team: L McSweeney, P Sheehan, I Burke, S Crowley, N O'Donovan, J Hurley, R Sheehan, J Kearney, R Crowley, J Wall 0-4 all frees, D Whelton, C Hickey, D Harrington 1-2, E Lyons, C Crowley. subs used, K O'Neill. 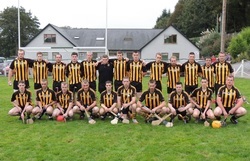 Cian O’Leary’s first half goal strike proved crucial as Kilbrittain advanced to the quarter-finals of the Premier Intermediate Hurling Championship following a tough intense game on Sunday afternoon in Kinsale. Not a classic by any means, for defeated Valley Rovers, their demise was largely of their own making; the concession of too many scoreable frees and a failure to take advantage of a plethora of second-half scoring opportunities. Their mentors on the line could only shake their heads in disbelief as the players racked up wide after wide to leave Kilbrittain in control of a game noted for its intensity, but which lacked finesse. Valley Rovers finished with 14 wides, 10 of them in the second half as the battle for a quarter-final spot raged. Kilbrittain, although struggling to find the target from open play, were at least consistent with six first-half and five second-half wides. Going forward they will surely know that an over-reliance on the free-taking expertise of Jamie Wall won’t be sufficient against the level of opposition they are bound to face. The pleasing aspect for Kilbrittain was the huge work rate with hooks, blocks, tackling and harassing Valleys throughout. Kilbrittain failed to score a point from play during the first half and, indeed, their first arrived 12 minutes from time from the stick of Pat O'Mahony. In that sense, Cian O’Leary’s 14th-minute goal was critical in maintaining their slender advantage throughout. Cork U21 Jamie Wall’s frees kept Kilbrittain’s first half tally ticking over, 5 points in all, while Eamonn Collins and Kevin Canty made the biggest contribution to Valley Rovers’ first-half total of 0-8. O’Leary’s major in the opening quarter was exceptional in that he gathered possession straight from a puck-out and finished brilliantly with a diagonal strike that Ger Rice had no chance of stopping. Ross Cashman sent over a long range free to give Kilbrittains tally of 1-6 at half-time. Rice had earlier denied Tommy Harrington with an excellent stop and he went on to deny Wall in the 42nd minute with a half-block that allowed defender David Lynch to divert the goal-bound sliotar away to safety. that Canty actually scored the first score from play of the second 30 well into the final quarter. That was just one of three, however, and Kilbrittain were able to add to their slim half-time advantage by outscoring their rivals four points to three, the points coming from Wall, a free, the aforementioned Pat O'Mahony, Wall from the tightest of angles (following a good crossfield sideline cut by David Desmond) and Maurice Sexton two minutes into injury time. This was the 'insurance point' as it put three between the sides. Valleys had time to point from a free a minute later but it was too little too late as Kilbrittain held on for the victory despite being reduced to 14 men with time up following a second yellow card shown to Darren Hickey. Kilbrittain now await the outcome of Mallow and Watergrasshill to see who they will face in the quarter-final. Scorers for Kilbrittain: J Wall 0-7 (6f), C O’Leary 1-0, R Cashman (f), M Sexton, P O’Mahony 0-1 each. Scorers for Valley Rovers: E Collins 0-5 (3f), K Canty 0-3, R Butler (f), D Crowley, R O’Donovan 0-1 each. Sub used: F O’Connell for Harrington (45). Murphy; R O’Donovan, R Butler; D Crowley, T Fitzgerald, F Lynch; D Looney, E Collins, K Canty. Subs: E Fallon for Fitzgerald (46), J Burke for Butler (46), E O’Reilly for Crowley (46). 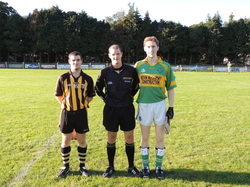 Referee: D Kirwan (Eire Og). Kilbrittain and Diarmuid O'Mathunas met in the quarter-final of the Kinetica West Cork championship on a perfect evening for hurling in Bandon. Kilbrittain started well despite the first score from Mathunas in the first minute. Two Des Deasy frees put Kilbrittain ahead by the 5th minute. By the 11th minute Fintan O'Connell and Seamus O'Brien had added two more and Kilbrittain lead by double scores, 0-4 to 0-2. Kilbrittain were dominating most sectors of the field at this stage but then Mathunas came right back into the game when they dropped in a high ball that seemed to deceive both the backs and goalkeeper Terry O'Regan and it ended up in the net. Kilbrittain were quick to reply and the next move saw a Declan Harrington shot hit the post and go off wide. Des Deasy levelled the game with a pointed free on the quarter hour mark but then Mathunas in the next attack found acres of space to run straight through the Kilbritain defence and shoot for a goal. With there tails up they failed to increase the lead with 2 wides within the next thirty seconds. They added a point on the 18th minute and then Kilbrittain regained composure to score 2 points from the stick of Harrington to leave it Kilbrittain 0-7 Mathunas 2-3 with ten minutes to the break.Then Mathunas hit a purple patch and with a similar goal to their second added by 2 points had increased their lead with four minutes to halftime. Nigel Quinlan pulled one back for Kilbrittain with a pointed free quickly followed by another pointed free this time from Des Deasy. Mathunas pointed in the next minute with the last score of the half to leave it Kilbrittain 0-9 Diarmuid O'Mathunas 3-6 at halftime. Those three first half goals were to prove the difference between the sides as both teams couldn't really be separated in the second half. Kilbrittain were first to attack in the second half but Fintan O'Connell's effort drifted wide before Mathunas effectively put the game beyond Kilbrittains reach with a 3rd minute goal . Kilbrittain would never give up and Declan Harrington added a point a couple of minutes later. Mathunas replied with a point and then Harrington found himself clear and goaled with a bullet. This reduced the lead to six between the sides. Mathunas however added 2 points before Kilbrittain next score from Sean McCarthy with 10 minutes left. Kilbrittain were guilty of a few wides at this stage which they could have done without but with Mathunas finishing strong and despite sub Eamon Lyons pointing, Mathunas held out with another late point to win on a scoreline of Kilbrittain 1-13 Diarmuid O'Mathunas 4-11. Team: Terry O'Regan, Padraig Sheehan, Ivan Burke, Sean Crowley, John Kearney, David Hayes, Sean McCarthy 0-1, Nigel Quinlan 0-1 free, Paudie Hurley, Des Deasy 0-4 all frees, Owen Sexton, Fintan O'Connell 0-1, Declan Harrington 1-3, Seamus O'Brien 0-1, Denis Murphy. Subs used James Hurley, Eamon Lyons 0-1. An odd game in Cloughduv on Saturday evening. For 51 minutes, Avondhu’s progression to the last 16 of the Cork SHC proper looked to be a fairly hassle-free affair, and when Peter O’Brien hit his 11th point they led by 1-15 to 1-8. Carbery’s race looked run, and a pair of Eoin Kelly points appeared to be little more than consolation scores. When sub Alan Hayes tapped in after Rory O’Sullivan’s shot was blocked, however, all of a sudden there were just two points between the teams and then Ryan cut the deficit to the minimum with a 65. Avondhu were reeling, and when possession from the puckout could not be secured, a free was conceded just outside the 65, Kelly’s conversion of same never in doubt. The West Cork division could even have seized victory but time was called and, after brief uncertainty over extra-time, a replay was the decision. 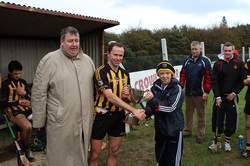 It was an outcome Carbery manager Noel Crowley was willing to accept. “It was a great comeback, we thought it was all over,” he said. when the whistle was blown, Maurice Sexton had the ball and he’d have put it over with his eyes closed. Too often, failure to get good ball into Michael Cahalane and Rory O’Sullivan cost Carbery dearly, but midfielder Eoghan O’Donovan and wing-back Pádraig Butler stood firm in the face of Avondhu pressure. Cork panellist O’Brien was in unerring form for the North Cork side, only missing an early 20m free where he went for goal, while right half-back Darragh Carroll and Eoin Dillon at midfield did well and Adrian Mannix showed flashes in attack. Cahalane thought he had procured a second-minute goal for Carbery as his shot was deemed by the umpires to have crossed the line before James O’Sullivan cleared it, but following consultation with referee Derek Carroll the flags were crossed. Avondhu a cushion, and the lead was 0-8 to 0-4 before first-half injury time provided a goal, Mannix winning a Carroll delivery and firing home. The early stages of the second half followed a similar pattern, Carbery doing their cause no help with some poor wides from placed balls before Kelly was given the duty, and Noel McNamara and O’Brien pushed Avondhu nine points clear. In the 40th minute, though, Carbery got some hope as O’Sullivan netted and John Sheehan and Kelly followed with points to leave it 1-11 to 1-7. Avondhu looked to have weathered that storm as Danny O’Flynn and O’Brien scored, and had McNamara made the most of a half-chance of a goal then they surely would have been out of sight. As it was, they were pegged back but still remain alive, and manager Johnny Keane was not going to lament his lot too much. “We started very poorly in the first 10 minutes,” he said, “but we were in cruise control after that, especially in the first 15 minutes of the second half. Scorers for Avondhu: P O’Brien 0-11 (9fs), A Mannix 1-0, A Watson, A Cagney, N McNamara, D O’Flynn 0-1 each. Scorers for Carbery: E Kelly 0-6 (4fs, 1 65), R O’Sullivan 1-1, A Hayes 1-0, J Wall (frees), M Cahalane 0-2 each, J Sheehan 0-1. AVONDHU: K Walsh (Kilworth); C O’Flynn (Charleville), J Hennessy (Ballyhea), J O’Sullivan (Fermoy); D Carroll (Fermoy), M Walsh (Kildorrery), J Hayes (Mallow); E Dillon (Milford), D O’Flynn (Charleville); S Beston (Ballygiblin), P O’Brien (Kildorrery), A Watson (Milford); N McNamara (Kilworth), A Cagney (Charleville), A Mannix (Kilworth). Subs: H O’Gorman (Milford) for Beston (5, injured), D Pyne for O’Gorman (44). Crowley (Bandon), E O’Donovan (Bandon); M Sexton (Kilbrittain), R O’Sullivan (Argideen Rangers), J Sheehan (Argideen Rangers); E Kelly (Newcestown), M Cahalane (Bandon), J Wall (Kilbrittain). Subs: D Hickey (Kilbrittain) for D Crowley (51), A Hayes (Kilbrittain) for Sheehan (53). UNLIKE its counterpart in the double-decker programme at Enniskeane on Monday afternoon, this Kinetica South West junior A hurling championship first-round tussle between Kilbrittain’s second team and Kilbree was in doubt until the dying moments of an exciting game. Ironically, it was two substitutes, James Hurley and Eamon Lyons, who teamed up superbly, as Declan Harrington powered home the crucial third Kilbrittain goal in the 58th minute. Even then the Seasiders could not relax as gallant Kilbree surged forward from the puckout, in one last desperate foray. However, a pointed free by one of their long-serving stalwarts Kevin O’Donovan was their only reward, as fine defending by the Kilbrittain defence, in particular Nick O’Donovan and Dave Hayes, thwarted the Blues for a final time. of paramount importance to the result. Another factor to be considered is that on glancing at the scoreboard, the spread of scores by the Kilbrittain personnel was much more comprehensive than that of Kilbree, who had Kevin O’Donovan accounting for 0-9, while Liam Daly had 0-3 and Darragh Coakley scored 1-1.
with the sides being level on four occasions in an exciting opening 20 minutes. Liam Daly, who worked very hard in the Kilbree cause, opened proceedings in the very first minute, before Des Deasy began his scoring crusade with points from play and a dead ball. Kilbree broke downfield, Daniel O’Leary found the impressive Darragh Coakley and from close range he flicked the ball high into the Kilbrittain rigging past Terry O’Regan. stage as first one team, then the other, had periods of supremacy. Then just on the blow of half time with the match poised on a knife’s edge, 1-8 to 1-7, and Kilbree just in the ascendancy, Kilbrittain struck for a crucial second major. Declan Harrington won possession, parted to captain Denis Murphy and when alert Kilbree keeper Denis Dullea parried his drive, the lurking Paudie Hurley swept the rebound home. A cruel blow to Kilbree, it was to get worse before it improved as Declan Harrington rattled over another point on the second half resumption, 2-8 to 1-8. However, Kilbree refused to go away and with Kevin O’- Donovan faultless from frees and Liam Daly, Coakley and Shane O’Donovan still battling away, they chipped at the Kilbrittain lead. But the ability of the Black and Amber to match like-with-like, and with Deasy proving an ace in the scoring pack, it was nip and tuck until Harrington sealed it at the death. Scorers Kilbrittain: Des Deasy 0-7 (4f), Declan Harrington 1-2, Paudie Hurley 1-0, Seamus O’Brien 1-0, Nigel Quinlan 0-1f. Kilbree:Kevin O’Donovan 0-9 (6f, 1 65), Darragh Coakley 1-1, Liam Daly 0-3. O’Donovan, Dave Hayes; Owen Sexton,Nigel Quinlan; Fintan O’Connell, Paudie Hurley, Des Deasy; Declan Harrington, Seamus O’Brien, Denis Murphy. Subs used: Eamon Lyons, James Hurley. Kilbree: Denis Dullea; Dave O’Donovan, Brian O’Donovan, Liam O’Brien;Damien Bennett, Danny Kelly, Timmy O’Donovan; Ray Collins, Shane O’Donovan; Daniel O’Leary, John Clancy, Darragh Coakley; Thomas McCarthy, Liam Daly, Kevin O’Donovan. A first round win it may have been but to witness Kilbrittain whooping and hollering at the final whistle would have the neutral believing it was something wholly more significant. But that would be to miss the point because the West Cork men have been well below the radar — with good reason, ever since they won the Intermediate A grade in 2010. And the manner in which they dug this out against a most dogged opponent at Páirc Uí Rinn suggests they are ripe for a cut off the county this year having been stagnant since their elevation to the top grade three seasons ago. But how close they were to losing this. Cork legend Diarmuid O’Sullivan stood over a free with the last puck of the game, 21 yards out with a goal the only option as his side trailed by two. He drilled one in 10 minutes previously to haul his side back into contention after a 10-minute scoring drought and the smart money would have been on him repeating the act and rescuing the match. But the Kilbrittain rearguard flung themselves square in front of it to thwart his effort and held on as Nathan Wall’s final whistle sparked scenes of euphoria. all, just 12 months since they narrowly lost to reigning senior hurling champions Sarsfields — before being relegated four harrowing months later. However, they shipped a massive blow —self-inflicted, mind — after just four minutes when Colm O’Sullivan inexplicably floored a Kilbrittain defender Cal McCarthy off the ball and was promptly sent off. That forced Cloyne into a reshuffle, with O’Sullivan and fellow veteran Conor Cusack isolated inside. The tactic worked perfectly for as long as they had legs— but coming down the stretch Kilbrittain’s young guns found theirs, stretched them, and in a crucial 10-minute spell (45-55) knocked over six unanswered points to leave Cloyne gasping for breath. A weaker team would have folded as the East Cork men came searching for an equaliser, but it was then that Kilbrittain’s outstanding performers stood up. the afternoon and his side’s 17th score, 11th from play. It was a fluid move — not their first, but they struggled for that off-the-cuff style in the opening period as Cloyne smothered them with voracious hunger and tenacious tackling. Jordan Sherlock and Brian Fleming were immense for Cloyne and stifled the threat of Wall — who was having enough trouble trying to beat Killian Cronin. In midfield, Donal O’Sullivan walloped over two brilliant scores from distance while Keith Dennehy — now deployed as a lone ranger to occupy the spaces vacated by Colm O’Sullivan, popped up with some sweet points. stalemate at the break would have pleased both managers. On a sweltering day, Cloyne’s patched up — and ageing side began to wilt as Wall, sub Pat O’Mahony, Cashman and Sexton all began finding space. That six-point scoring spree sandwiched a couple of Cloyne wides and Wall could have sealed it on 52 minutes when he skinned his marker but had his ground shot turned round the post by Cusack. But they weren’t to be denied a famous win. Scorers for Kilbrittain: J Wall 0-9 (6f), M Sexton 0-4, C O’Leary, V Hickey, P O’Mahony, R Cashman (65) 0-1 each. Scorers for Cloyne: Diarmuid O’Sullivan 1-5 (1-3f), K Dennehy 0-3 (2f), Donal O’Sullivan 0-2, L Cahill, C Cusack 0-1 each. Hickey, J Deasy, C Hickey; M Sexton, C Moloney, C O’Leary; A Hayes, J Wall, T Harrington. Subs: P O’Mahony for T Harrington inj. (12), David Desmond for D Hickey (34). CLOYNE: D Óg Cusack; J Sherlock, K Cronin, B McCarthy; B Fleming, J Nyhan, S Beausang; Donal O’Sullivan, D Cahill; P O’Sullivan, C O’Sullivan, K Dennehy; L Cahill, Diarmuid O’Sullivan, C Cusack. Subs: C Smith for S Beausang (48), P Considine for P O’Sullivan (52).